Teaching children about their five senses? This is a great daycare activity because the senses book helps to reinforce what has already been learned. There are pages for each one of the senses; sight, hearing, smell, taste and touch. 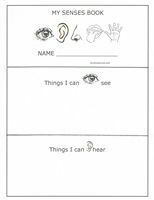 As you are teaching about each of the senses, have them also create a page for their own take-home book. There are many activity ideas below for teaching each of the five senses. Teach one sense every day for a week, or concentrate on one sense per week for five weeks. Either way, the kids are bound to have lots of fun discovering all that their senses can do. This project was interesting, in that, each completed booklet was unique. The children may have made different pictures but it was clear they understood the concept. And being able to take the completed book home to share with their parents made my kids super excited. Print out both pages of the book for each child. Cut on the lines to form six pages. Staple the pages together on the left side to create a booklet. This book can be used in a couple of ways. Either have the children draw pictures with markers and crayons, OR have them find pictures in old magazines to paste in the appropriate area. *Because children learn best through repetition, teach one of the senses each day for a week, and let the children fill in the correct page at the end of the day. This booklet will build upon what has already been learned. It will also offer your daycare children a way to share their experience with their parents. Take home items create a bonding experience between kids and their parents. The kids get to relay everything they have learned and the parents are more aware of what their child is learning in daycare. Visit the PRESCHOOL THEMES section for lots of ways to teach about a single topic.